There is simply nothing like Supergiant Games’ unorthodox but compelling RPG. What is freedom? Is it the ability to do as one pleases without fear of repercussion or repression? Is it the simple, natural feeling of being comfortable as yourself? Does it run counter-productive to the needs of society? Freedom has many ideological and spiritual meanings but in Supergiant Games’ Pyre, freedom is a concept you discover and make peace with. It’s all-encompassing, sure, but it’s also a journey. After all these years, Supergiant still has a certain quality to its titles. Bastion told stories of hatred and prejudice but also of understanding and new beginnings. Transistor was about deception and retribution but also love and sacrifice. 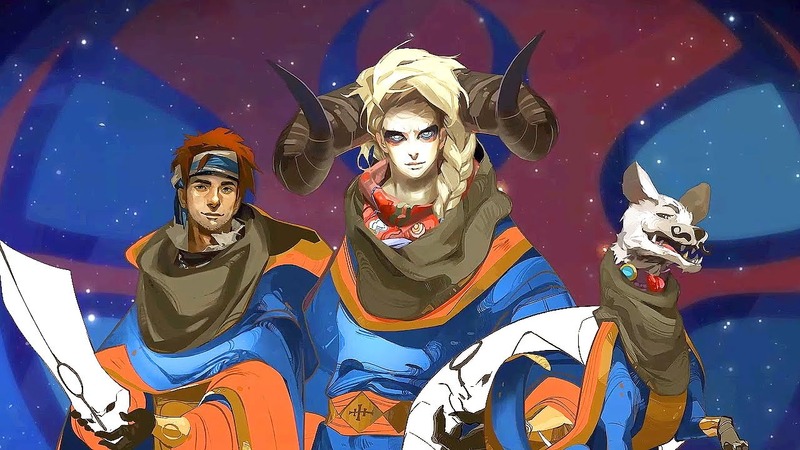 Pyre is arguably about so much more but still incredibly sophisticated. There are undertones to read, clever bits of lore tucked here and there, and many themes working at a subliminal level. "Rest assured, more individuals will join your ranks, further diversifying the tactics that can be employed as well as the banter around the blackwagon." You begin Pyre as a Reader, cast out from the great city of the Commonwealth into the Downside with the other Exiles. A group of said Exiles happens upon you and enlists your talents for the Book of Rites. This book channels the ancient Rites wherein two teams battle over extinguishing their opposing Pyres. What is at stake in these competitions, organized by the mysterious and powerful Eight Scribes? Why, the right to battle for freedom. First you have to be in good standing and that itself is a perilous undertaking. Your group are the Nightwings, a motley organization formed from various races. Hedwyn is a nomadic human that’s easy-going but stern when the situation calls for it. Jodariel is an imposing, horned woman who can be militaristic but still has a heart and the ability to laugh (sometimes). Rukey is a mustachioed cur who talks tough but moves quick. Each Nightwing has their own distinct abilities and traits to bring into Rites which we’ll get into shortly. And rest assured, more individuals will join your ranks, further diversifying the tactics that can be employed as well as the banter around the blackwagon. Unlike past Supergiant games, you’re moving from one Rite to another, talking to your companions and learning their concerns, and making decisions about which route to take. If you’ve played The Oregon Trail, you’ll know what to expect (minus the dysentery, of course). It’s a very menu-driven experience but one that’s full of colour and personality. When you’re not deciding to take the low road and unearth some valuables or be blessed by the Eight Scribes, gaining other benefits for your companions or yourself, you’re learning more about the game’s world via the Book of Rites. "It doesn’t just seem like you’re in a dirty place with dangerous critters lurking in the dark. You actually feel like it and the various reactions from your teammates support that." Sometimes, you’ll be able to pursue your own “vocations” and can either enhance one of your innate passive skills (such as increasing your teammates’ auras, speed and decreasing banishment time), or choose to mentor a companion, thus bestowing tons of “enlightenment” aka experience on them. A traveling salesman named Ron holds different Talismans to confer various perks for your Exiles. He also sells materials for strengthening Talismans so it’s always worthwhile to keep a few Sol handy for when Ron comes calling. Much of your time traveling sees you immersed in a variety of environments, tackling issues like new party members like the moon-touched girl who’s name you decide. Different routes can offer different benefits along with detriments towards the next Rite. Each setting is simply breath-taking in its splendor. Some environments offer volcanic and rocky passes that are tough to traverse. Others see you traveling through ghastly plains that can sap the hope from your Exiles. 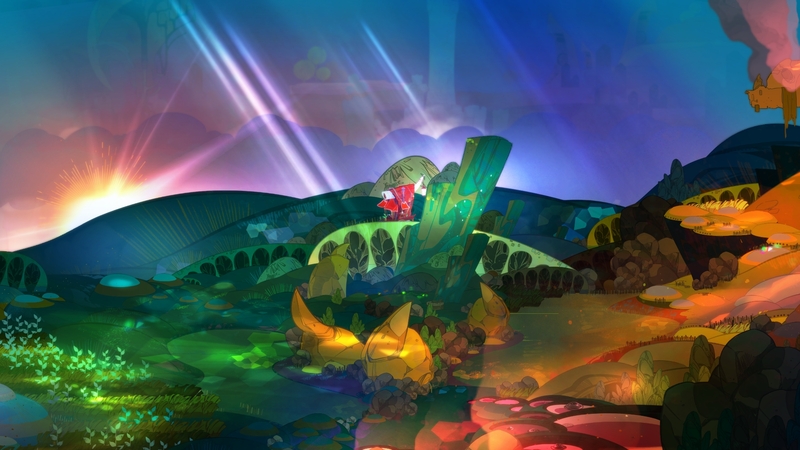 I won’t spoil some of the cooler environments you get to traverse but suffice to say that the art direction and visual fidelity in Pyre is simply phenomenal. This is especially so because even if much of the splendor is confined to a traveling screen and character interactions, it creates an all encompassing sense of immersion. It doesn’t just seem like you’re in a dirty place with dangerous critters lurking in the dark. You actually feel like it and the various reactions from your teammates support that. "It sounds simple and quite frankly, I found it deceptively so when first starting out." The Rites themselves are where the action’s at. Essentially, you select three Exiles, take possession of the Celestial Orb in the center of the field, juke around your opponents and attempt to dunk it in the enemy Pyre while protecting your own. It sounds simple and quite frankly, I found it deceptively so when first starting out. However, each Exile has their own Aura. These can be used to dispel opposing team members for a set period of time (known as banishment), thus clearing the way. These Auras can also be cast to attack from a distance. Possessing the orb renders your Exile vulnerable and without an Aura but you can still pass to teammates. Alternatively, the orb can be flung aside while you attack or re-position your allies better. To give you a better example of how this works: Hedwyn starts off possessing the orb. He passes to Jodariel who creates space by jumping up and landing near enemies, throwing them off balance. Fling the orb aside and go back to Hedwyn to mop up your foes. However, Hedwyn can also receive the orb and leap over them into the Pyre. Or maybe you’ll take advantage of Rukey’s quickness to quickly flank around enemies and score while they’re distracted. Stamina is used for sprinting and jumping so passing and knowing when to survive while setting up plays is of utmost importance. If that weren’t enough, each time you score, that Exile in question is banished for a long period of time, thus turning the next round into a 2 vs. 3 affair. Don’t worry though because when the enemy scores, the advantage is on your side at that point. 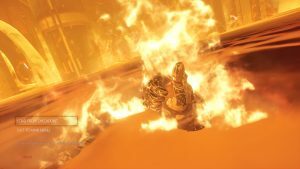 "Perhaps the most amazing thing about Pyre is that the game doesn’t end if you fail a Rite." As you progress through the Rites, each Exile earns enlightenment with new skills unlocking at higher ranks. Jodariel may regain stamina from killing foes or increase their banishment from the field. Hedwyn gains the ability to revive banished Exiles at the spot they fell while also adding stamina regeneration to his teammates. Rukey can double-jump and deal more damage when diving into the enemy Pyre. Different Exiles add their own abilities and morph your strategies accordingly. Similarly, different factions will have their own abilities and influences on the land to gain an advantage. The sheer range of groups is something to behold from bloodthirsty curs and fiendish bog-dwellers to sycophantic tree people and noble wyrm knights. However, it’s the characters themselves that can be simply amazing, whether it’s Hedwyn’s mysterious yet kind nature, Ti’zo’s flitting about and wise disposition, Pamitha’s seductiveness or the sheer enigma that is Volfred. Every single character is uniquely designed and compellingly written. The game also tells a great story with lore emerging with key parts in the dialogue. While I may currently prefer the music of Bastion and Transistor, Pyre‘s soundtrack makes a fairly strong claim. Tariq’s tunes are lilting and endearing, expressing the vulnerable nature of your journey, while the background score ranges from catchy to surreal. There are rock intonations existing side by the side with the simple, melodic background score that you can’t help but smile at. Perhaps the most amazing thing about Pyre is that the game doesn’t end if you fail a Rite. In fact, there are twists to the supposed end goal as well. 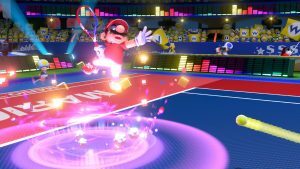 Rest assured that you’ll be replaying the game, revisiting key locations and teams that have been beaten already (albeit with new techniques and abilities) while unlocking more information on them. 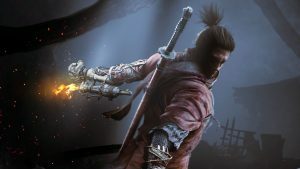 The characters grow and evolve in their personalities with special “trials” being held to add powerful exclusive Talismans to their repertoires. "There’s nothing quite like it but if there were, the charm of Supergiant Games shines like a beacon throughout." The mysteries of the world begin to unravel and you learn about the Commonwealth that emerged from a fallen empire. The Eight Scribes are revealed as more than just mystical figures. 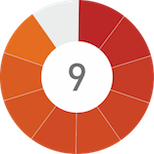 Those well-versed in the standard Supergiant length of games can expect a somewhat longer experience this time around, especially if they attempt everything. Pyre is a spell-binding traipse through a mystical world, one who’s store speaks to the player in hushed tones as it does melodic outbursts. It’s a game with a heart that’s as strong as it is firm, always by your side and yet never patronizing you with its plot. While I will throw out the standard “not for everyone” tagline (and not as a negative, don’t worry), it is a game who’s characters, story and exploration are worth endearing yourself to. Each battle is like a learning experience and the toughest battles often feel the most rewarding. Though an uneven frame rate could be spotted (my system is an Intel Core i5-4440 with 8 GB RAM and a Zotac GeForce GTX 770 for reference), it happened on a few occasions and was never game-breaking. 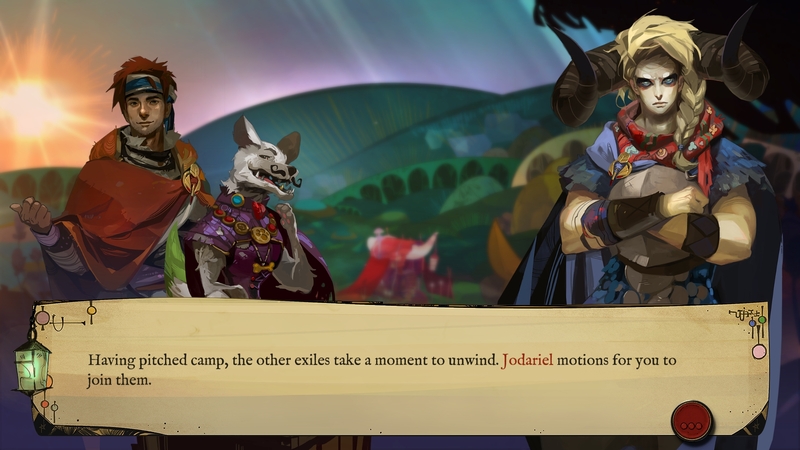 As a whole, Pyre is polished, refined and offers the perfect narrative blend between its radical world and outlandish combat. There’s nothing quite like it but even if there were, the charm of Supergiant Games shines like a beacon throughout. Spell-binding visual direction and character design. Compelling battle system that's easy to pick up and fun to master. Excellent writing, reflected in the lore and world building. Music is satisfying and fits the atmosphere well. Oregon Trail-like decision making feels meaningful and encourages exploration. Some slight frame rate issues that are few and far between. 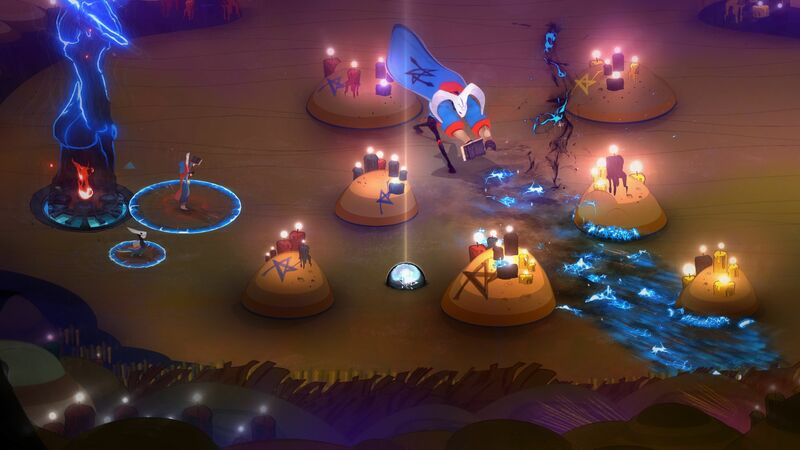 You've never seen anything like Pyre but you have to check it out. 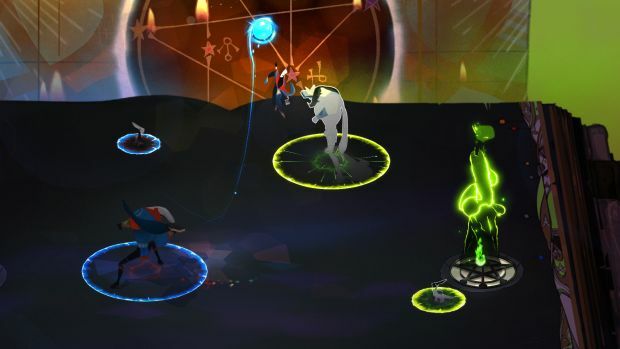 Whether you enjoy unorthodox battle systems, great story-telling and characters or a gorgeous amalgamation of visuals and music, Pyre is truly a stand-out in Supergiant's portfolio. And that's saying something.